How did your career in advertising begin and what have been some of your most significant milestones so far? I think it goes back to deciding to go to art school instead of going down the typical 4-year college route. I’m sure I missed out on some things (like a crazier level of partying) but it was the right choice for me. I ended up getting really into graphic design, which led me to advertising. For some reason before I got into it, I never considered advertising as a career option. These days it’s a pretty popular option, kids coming out of high school already know that they want to be in advertising. For me it was more of a discovery. Finding out that they’d actually pay you to be creative, working with other really creative minds, travelling, and making things that millions of people would be exposed to, I mean I was sold. I haven’t really thought in terms of “milestones.” I think when you do what we do, you’re always hopefully in the middle of a new project that gets your juices flowing and has your creative focus. I feel like whatever success you get is already in your rear view window. We keep moving on to the next thing. 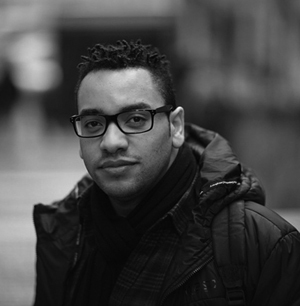 As Group Creative Director, what are your main responsibilities within the NY office and wider Draftfcb network and how is your team structured? I think what I’m doing now is trying to address the bigger question of how do you make a place, a culture that will foster and consistently turn out great creative. I’m sure all the ad greats who were a lot better than myself were confronted with this. One thing I’m trying to do along with my CCO Javi Campopiano is making sure we keep the creative bar as high as we possibly can. I know I’m using the word ‘creative’ a lot, but that’s all we’re about right now. It’s exciting for us because we finally feel like we have all of the pieces in place to do some extraordinary work, and that’s where you want to be. Tell us about some of the changes you have made to the agency since taking up creative leadership in June. I think right now, Draftfcb is going through a rebirth, a reboot. My first job in advertising was at FCB San Francisco, when they had clients like Levi’s and Sega. It had that feeling of being a hot shop, it had that energy. Javi and myself, and a whole new team at the top (including our new CEO Carter Murray) are trying to bring that feeling and excitement back. We’re always looking for and trying to find those opportunities to do great work with our existing clients and with potential new clients. One of our main jobs has been bringing in new talent. I think coming in, we realized that we needed to help nurture our creative culture, and this is going to be ongoing. It’s the good kind of challenge. It sounds cliché, but I think you have to take risks and can’t be afraid to fail. We all have standards when it comes to the ideas we’re willing to present, but I’ve seen teams kill way too many ideas before it even gets to their CD. You can start to stifle yourself. You shouldn’t feel like you’re going to get beat up or mocked for putting an idea on the wall. Also, don’t be too self-satisfied. Your first ideas probably aren’t going to be Gold Lion worthy. Keep improving on them, re-write them, look at the whole thing in a different way, get weird, keep pushing yourself, the process doesn’t stop until it’s out in the world. We don’t work in some 9-to-5, leave your work at the office kind of business. Your ideas don’t just leave you when you leave the agency at the end of the day. You have to be passionate about this, you have to love it, even when you hate it or feel frustrated. I made this job sound like an unhealthy relationship. And maybe it is at times. Which creative minds have you most enjoyed working with during your career? I’ve been lucky, I feel like I’ve gotten a chance to work with some of the best creative minds in this business. At Ogilvy & Mather I learned from Brian Collins that brands have to live in and be a part of culture. I learned a lot from Rich Silverstein about tenacity and craft. I learned from Chuck McBride what a truly pure creative looks like. I think the element they all have is an intense passion for this thing we do, they’re all the kind of guys that look forward to coming to work every day, and crazily enough, they’re all still hungry and seem compelled to create that next great work that’ll surpass whatever’s come before. That inspires me. If you’re a young creative, try to find a mentor and learn as much as you can from them. 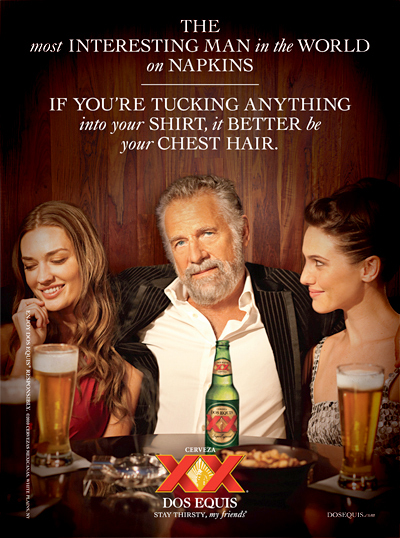 What was it like being a part of the Dos Equis “The Most Interesting Man in the World” campaign. I feel very fortunate to have been a part of it. I love how counter-intuitive it is; an older guy selling beer to an audience in their 20s, early 30s. There are so many campaigns that are famous within the industry that people outside of it have never heard of. It’s rare that you can work on something that’s both famous with the public at large and within our world. I think there are only a few campaigns that achieve that, I’m thinking the Geico work, Nike, Got Milk, Direct TV, and only a handful of others. There’s something rewarding about going to your barbershop and hearing people quote your lines back to you. I was lucky to work with really talented people on that, and a client that was willing to take chances. How do you handle risk averse clients? I think it’s today’s advertising climate in general. It’s scary to be the first one that’s going to take that risk, or go with the idea that might not have tested as well as others. The truth is if marketers don’t go with their guts, put their necks out there and take a chance on the thing that has never been done or seen before, they won’t make an impact on their audiences. I don’t think it’s a choice anymore, there’s so much advertising out there, and the audience is so scattered, that you have to figure out a way to stand out or you just become background noise. Safe is more dangerous than risk. Some creative out there made a funny insurance ad, and all of a sudden every client wanted one and it completely changed the category. Same thing happened with Old Spice. Every agency probably got asked to do a version of the “I’m on a horse” commercial. It’s safer to copy what’s worked than originate something fresh. I’ve been incredibly lucky that I’ve had a chance to work with some smart clients who are aware of this. But the easiest thing to do for risk-adverse clients is to show them work that they can’t help but get excited about. What work that’s out right now do you think is great advertising? Honestly, there’s not a lot out there that I love. The “Intel Inside” films were pretty well crafted and smart. I like some of the Direct TV work, it’s been pretty consistent. I also tend to like almost anything Gerry Graf and his agency does. It’s a very specific kind of humor that stands out. But, I think in general a lot of work these days is safe and unfortunately, forgettable. It’s not necessarily a bad thing, the current environment is actually a big opportunity just waiting for a smart marketer out there. What advice would you give people starting out in the industry? You have to realize that this world isn’t like Madmen or any other show you see that glamorizes the business. It’s long hours and disappointments, and you’re lucky if a fraction what you think are your best ideas survive the process and get made. But if it gets into your bloodstream, not doing this job becomes less of an acceptable option. I think the first thing you have to do in school and coming out of school is constantly develop your own voice and perspective when it comes to the work. Build up your discernment and taste levels. Then I think at a later point, you have to be harshly honest with yourself and figure out what your weaknesses are. Are you just a funny copywriter that shies away from doing anything emotional, or ideas that are purely visual? Do you make great work but you can’t express or present them? Whatever your weakness is, focus on it and get rid of it. Also, don’t get stuck watching only one kind of TV show or movie, going to the same old sites, or listening to one genre of music. We have to be able to communicate with everyone, expose yourself to all the culture you can get. This entry was posted in Advertising on October 10, 2013 by Creative Interviews.